I had succeeded in driving clear across Utah after climbing Nevada's Mt. Moriah in the morning, landing myself in Montrose, CO before sunset. I spent a few hours there before driving up to Buckhorn Lakes Park at over 10,000ft in the southeast corner of Montrose County. It was well past sunset when I left Montrose and after 10p before I had reached a good spot to spend the night in cooler temps. I was there to climb Castle Rock the next day, the county highpoint. Up around 6a, I had more driving to do while I ate my breakfast. I had grabbed a GPX track from PB, but I probably should have done more research on this one. I didn't realize the road continues past Buckhorn Lakes, a rough 4WD road that saved me about 2mi each way. I stopped about a quarter mile short of the 4WD parking area because I was worried about a large rock in the road. After examining it closer, I could have driven over it, but I'd already parked and shouldered my pack. Past the 4WD parking, the road/trail continues, but is only suitable for ATVs or motorcycles. Or peakbaggers on foot. Both of the peaks are located along the N-S Cimarron Ridge. The ATV trail goes around the north side of the ridge, through two impressive pinnacles, North and South Sawtooth Rocks. Because the trail is in dense forest, one can't see the pinnacles though they are less than a quarter mile on either side. The trail then turns south as it passes below the east side of Cimarron Ridge, again heavy forest preventing views of the ridge. I followed the GPX track for a mile and a half until it left the ATV trail. I found no sign of ducks or a use trail, though I did find a small orange ribbon on a tree. The GPX track at this point was useless. It was unnecessary to follow it closely as the cross-country in the area was pretty much the same - steep and forested with wet vegetation in the understory. After 2/3mi, I reached the crest of Cimarron Ridge where I found a use trail and much easier going. The ridge climbs steeply up to Storm King, the first of the two summits. It was difficult to identify its highpoint, the one shown on my GPSr was in the middle of the forested ridgeline, a flattish area with no obvious point. A bit disappointing. Castle Rock is another half mile to the north, an easy hike with no real elevation loss between the two points. 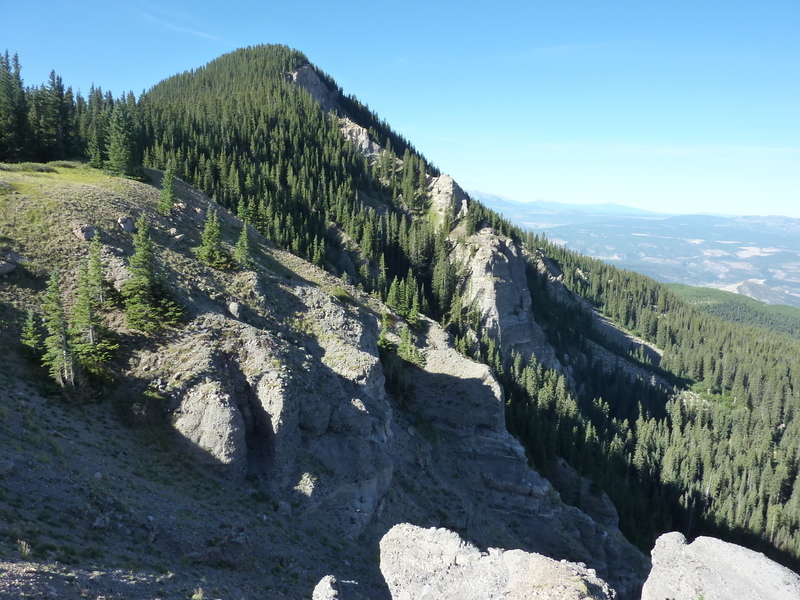 I "discovered" that the west side of the ridge had some dramatic cliffs with fine views to the west and P8> southwest to the San Juan Mtns around Ouray. There was some easy talus walking along portions of the cliffs on that side as well, which I availed myself of. About 2/3 of the way to Castle Rock, I switched to the east side where I found some views off that side, too. There is a short bit of steep climbing up to the highpoint where no impressive rock outcrop is found, but rather an old antenna installation and service shack, none of it apparently maintained any longer. A few dozen yards south of the installation I found better views to the south and a CMC register tucked into a rotting stump with a cairn. I dutifully signed the darned thing though I don't like the format - ruled pages with little room for more than a date, name and hometown. Not that I write any more than the date and my name, mind you, I just don't like that they make for boring reads. I returned back to Storm King and did a better job trying to find the highpoint which I think is on the west side of the ridge. I found some sticks leaning against a tree here, so placed a makeshift register under the sticks and called it good. I thought I would pay the two Sawtooth Rocks a visit and followed the use trail down the ridge to the north. The trail is faint in places and good in others, but overall a shorter and much better route than the one I'd ascended. I got good views of the rocks during the descent, enough to see that they were not simple, nor even hard scrambles. Composed of crumbling conglomerate rock, they looked most difficult and I gave up without giving them a closer look. I followed the use trail down to the ATV trail, took a picture of the junction (no obvious markings here), and then continued the 3/4mi back to the jeep, finishing up by 9:30a, making for less than 3hrs roundtrip. On my drive back down from Buckhorn Lakes, I debated what to do with the rest of the day. I'd originally thought I'd go back to Montrose and then drive to Lake City and the trailhead for Wetterhorn Peak which I planned to climb the next day. This seemed like a lot of daylight to kill, much of it in the continuing heatwave at the lower elevations. After much back and forth, I finally decided to continued south on SR550 to spend the afternoon driving on the Alpine Loop in the San Juan Mtns between Ouray and Lake City. Not the fastest way to get where I was going, but I expected the scenery to be far better and the driving much fun. I was not disappointed. I stopped in Ridgeway for some supplies I'd planned to get in Montrose. I also topped off the gas tank and got a $10 car wash to give the jeep a little TLC. It wouldn't take more than a few hours for the shine to wear off. The highway and towns along it were incredibly busy, not surprising for a summer Saturday. I drove through 30>Ouray without stopping, then up the Million Dollar Hwy to the start of the Alpine Loop a few miles above Ouray. I'd been on other sections of this route out of Silverton, both in the van and on bike, but none of that was as rough as the first section from SR550 up to about 10,500ft, a distance of about 3.5mi. Rough and rocky with huge steps and uneven shelves, the jeep was up to the task and I was having a great time. I'm continually amazed at what this vehicle can do. The road was narrow and fairly busy, but the folks were all super-nice, making room to pass, waving, and generally looking to be enjoying it as much as myself. About three miles up from the highway, I found a large pickup truck parked at one of the nasty spots coming downhill. The woman got out and came over to ask me if I could help her through this section. I could, I offered, but it gets worse further down the road. Rain started to come down shortly before 3 ATVs came up the road behind me, unable to get through with our two vehicles blocking things. It was all rather comical. I moved the jeep up past her, put on a rain jacket and watched as the three ATVs squeezed through the gap I'd left. The last one was larger than the others and began to slip into side of the jeep. They were clearly going to hit it, so I asked them to stop and let me pull further up the road for more clearance. I then went back down to the truck to help the woman. She held out her keys to let me drive it, but I insisted she needed to drive because she'd need the practice for the rougher spots below. She was terribly nervous and had no way to turn the truck around (a sign at the bottom mentions "short wheelbase" and I could see why - the sharp turns were tough enough in the jeep). I directed here down the rough spot in the rain, then told here there were other folks coming up that might offer her further assistance. Hoo-boy. This was no road to learn on. A short distance up the road I pulled over to let a group of ATVs going downhill get by. The last in line paused to let me know my rear spring was hanging down. What?! I got out and discovered that the left spring had indeed broken its weld and was hanging down about six inches. This wasn't good. I didn't recall hitting anything, so I suspect the weld was weak. Knowing it's probably covered by my warranty wasn't much help at 11,000ft, far from any dealership. Not much I could do but continue, I figured. It reduced my ground clearance on that side so I'd have to be careful. If the same weld broke on the right side it would leave my rear wheels wobbling freely, so I figured no more rough driving. Luckily the road improved above this point, and though 4WD was still needed, there were none of the huge rock steps that would jar the vehicle strongly from side to side. The rain had only been brief and the skies cleared some, leaving a mix of clouds and blue sky and simply delightful temperatures around 55F. I reached Engineer Pass shortly after 2p and decided to pay a visit to the pair of summits on either side of the pass. Both are 13ers, neither more than easy class 2. I first tackled Engineer Mtn on the south side of the pass, a scramble of less than 10 minutes. It has commanding views over both side of the pass. There was obvious rain falling in the distance in at least three different directions, but the immediate area was dry with some blue skies overhead. Returning to Engineer Pass, I followed an old mining road to Darley Mtn, a distance of little more than half a mile. The highpoint is found at the north end of the ridgeline where I found a ruined CMC register (the plastic jar had been broken, leaving the unprotected paper to the elements). All around was incredibly green scenery, like nothing found in the Sierra. Regular thunderstorms allow abundant growth in the alpine zone, though most of it less than ankle-high and making for delightful cross-country travel. To the northeast was a high, rolling plateau called American Flats that would make for hours of fun walking if I'd gotten here earlier in the day. There was another 13er, unnamed Peak 13,132ft less than a mile to the northwest that I debated paying a visit. It was now just after 3p and I had plenty of time, but I worried that the overhead clearing from the storms might not last. After deliberating, I decided to play it safe and call it a day. I follwed the ridgeline south off the mountain, a fine alternative to the old mining road.